Emily Manning-Mingle was born in New York and currently lives in Boston, MA. She graduated from Boston University's School of Visual Arts with a BFA in Painting and an MFA in Studio Teaching. Emily's work has been exhibited in Massachusetts, New York, Texas, and Italy. Her work is part of a site-specific installation at Boston University and has received several awards, including a Constantin Alajalov Scholarship, a President's Scholarship from Anderson Ranch, and the Foundation for an Open America Painting Award. Emily has taught art to preK-high school students in public schools, after-school programs and BU's Visual Arts Summer Institute for the past ten years. 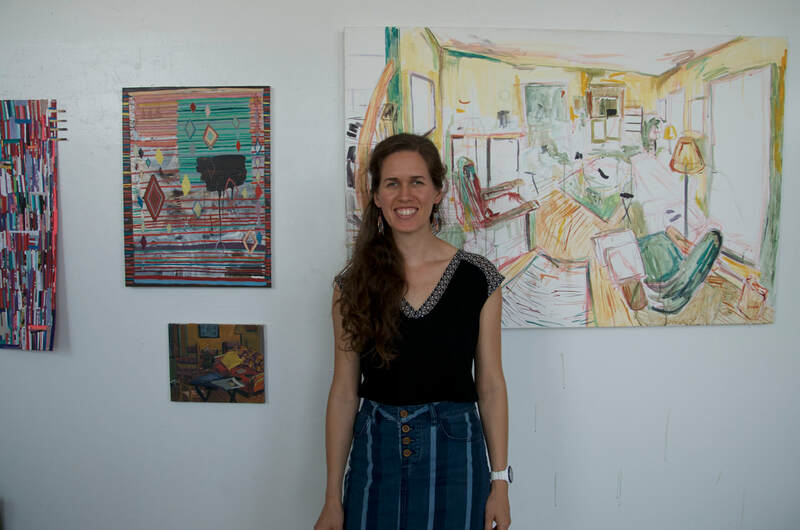 She is an active member of the ​Boston Critique Group, an artist member of the Cambridge Art Association and a junior varsity member of New Craft Artists in Action (NCAA). She is currently a member of Space.us in Cambridge, MA. "A painting is a quiet dialogue in which volumes of information are slowly and silently revealed, yet its entire essence can be experienced within a moment's glance. I believe my paintings are done in a language more closely in tune with my soul then the language of my tongue. For me, the act of painting is not just a means to a product; it is also a meditative process of communication." Inspired by observations, memories, and daily routines, Emily creates work that reinterprets traditional patterns and describes her experience of inhabiting domestic spaces. Born into a family of resourcefulness, thrift and industry, she enjoys collecting, altering, and re-purposing scraps; turning discarded paper, clothing, paint, magazines, letters, and other supplies into improvisational new compositions embedded with personal history. Employing various techniques, including painting, sewing, collage and assemblage, she explores themes associated with domesticity, routine, gender and consumption and draws attention to spaces and objects that are typically overlooked.